Let’s Go Munzee with Locus Map! According to the official Munzee website it’s a 21st century scavenger hunt. 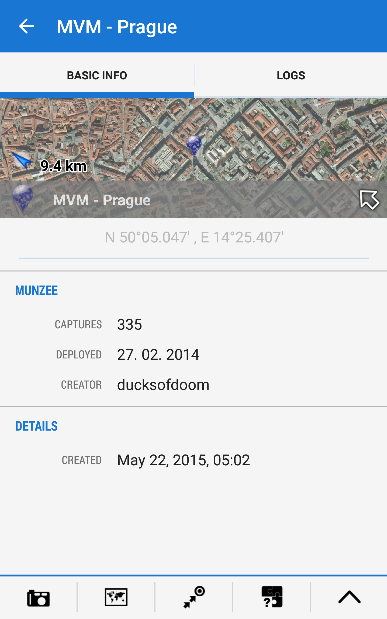 You must have already heard of geocaching – anyway, Locus Map is one of the officially supported geocaching apps. 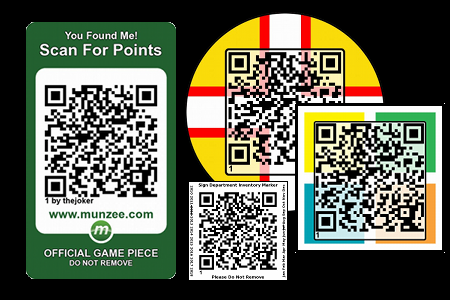 Munzee is something similar but the form of the treasures – players don’t look for boxes with logbooks and full of Kinder eggs toys but QR codes (a hint – small squares with “scattered tea” carrying coded digital information). 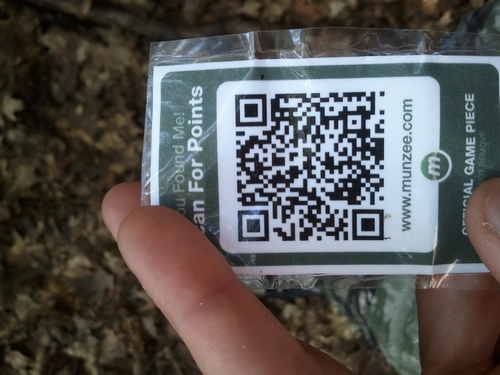 While geocaching required just a GPS unit and a pencil, For Munzee hunt you have to be equipped by a smartphone with a camera and the official Munzee app installed. Well, that’s not a problem today, such a machine can be fetched for a hundred bucks. The primary premise is the registration at the Munzee.com website, the same as with geocaching, where the player opens an account. As we said, Munzee players look for QR codes – when finding them they capture them with their smartphones, the Munzee app validates the QR codes and GPS position and in positive case it adds points to the player’s account. QR codes can be placed virtually anywhere – on a visible place, hidden in a box or covered by something. Most of all they exist in a form of homemade stickers or labels, magnets etc. purchased in the official game e-shop. Furthermore, points are added also for placing a new munzee and to the munzee owners for other munzeers’ logging. Each player reaches certain levels and gets further awards for his/her proceedings. The system is quite sophisticated and seemingly more playable than a bit passive geocaching. There are a few types of Munzees – the most widespread are classical munzees, sharing approx. 95% of all munzees which can be homemade – best of all printed on a sheet of selfsticking foil. Another type is the virtual munzee which exists really virtually only – it’s a zone that you enter with your smartphone, tap the munzee detail, select „Capture virtual“ and that’s it – munzee is found and logged. The zone diameter is approximately 90 m. The virtual munzee can’t be made at home, it can be purchased only in the game e-shop. Mystery munzee, unlike geocaching “mystery cache”, is not mysterious in its hiding – its mystery lies in the amount of points the player can get for its capturing. It may vary accidentally from 5 to 50 points. Virtual mystery munzee combines properties of the previous two, golden and diamond munzees bring a bunch of points both to its owners and capturers, NFC munzee can be captured only by a device with the NFC chip… And many more. One more thing – sort of geocaching “travel bugs” can wander among munzees – called Traveling Rovers. For further Munzee reading please visit Munzee.com. How to go Munzee with Locus Map? Firstly it’s necessary to install the Munzee add-on, that can be easily found in Google Play Store. A new Munzee button appears in the Addon section. Tap it, input your Munzee log in, confirm and check the “display munzees on a map” option. Munzees are on the map and Locus Map offers various options of navigation to them and other features. 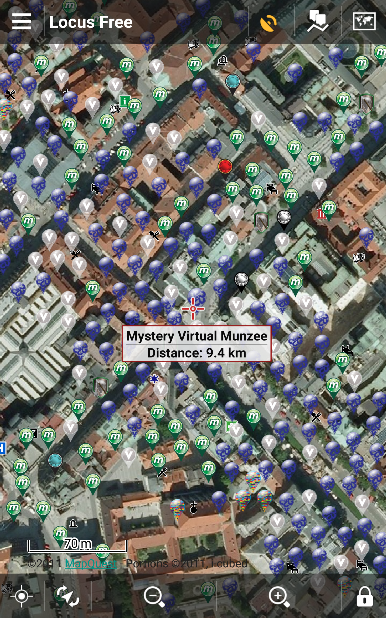 Tapping a munzee displays the detail with coordinates, the creator, number of captures, notes and also logs. Tapping the log opens the user info or option to send a message to him. You can also add your own comment or launch the official app for capturing the munzee. And now, enjoy your hunt and have fun! Parádní doplněk aplikace, jen ve článku odkazovaná možnost stažení offline dat je již nějakou dobu nefunkční. Je to škoda, tím se hra komplikuje (v místech se špatným pokrytím datovými službami) a prodražuje (datové služby v zahraničí). díky za koment, odkaz byl smazán.